Happy Last Day of 2015! Adobo for the big Frostbite Regatta potluck at the Sebago Canoe Club, fresh mootz for me and TQ. First time ever cheesemaking, so cool that the Flatbush Food Coop carries pasteurized milk (you can't make cheese with the more common ultra-pasteurized), will report back! Great way to close out the year. Update, 3:45 pm: OMG! LOOK! CHEESE! Rock Center Tree and Dyker Heights - A little more holiday stuff. Karen's on her way back to Texas now after a great visit, everything worked out nicely and it was so nice to see her again after a long time! 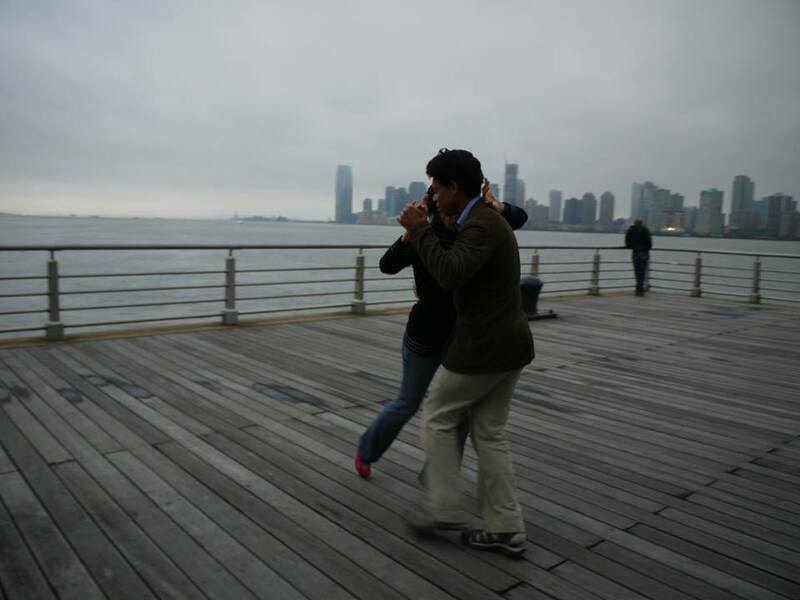 We'd gone separate ways on Christmas Day, TQ and I had already accepted an invitation to dinner at his parents' home before I knew she was coming, and although she would've been more than welcome, she was really enjoying seeing NYC in all its holiday finery, and also had a whole laundry list of restaurants she wanted to get to, so she stayed down here, and then we got a couple more seasonally-festive things in later in her visit too. Her last day in Manhattan was on Sunday; that's when we saw my friends at VolvoTango on the pier, and after a long walk around various areas in lower Manhattan, we headed for Rockefeller Center to see the tree. I think that of everything we did while she was here, that was about the only thing we might have skipped given a do-over - it was lovely and warm and the weekend and not too late at night and that area was mobbed like I'm not sure I've ever seen it before. Seriously, you could've populated a fairly respectable small town somewhere with the people present. We shouldered our way in, looked at the tree, looked towards the Teuscher store, decided it wasn't worth the trouble of getting there (we'd had a big, late brunch, and the walking areas on either side of the skating rink in front of the tree were absolutely jammed with people who didn't appear to be moving at all), shouldered our way back out, and called it a night. I did get some nice tree pictures though. The next day I went to work while Karen did some more solo sightseeing. She met me at work at the end of the day and then we met TQ at Purple Yam (she'd originally hoped to go to Onomea, the terrific Hawaiian place in Williamsburg, but they're closed on Mondays, but some good Pinoy cuisine was an acceptable substitute, mmmm adobo) and then after dinner, although the temperature was dropping and a drizzle with a bit of ice in it was starting up, TQ was a good sport, nay a great sport, and drove us out to see the famous holiday lights of Dyker Heights. Going on a cold (well, slightly colder than it has been) and sleety night after a long stretch of semi-tropical (or at least they felt that way compared to normal winter weather) temperatures turned out to be a great way to see these world-famous displays; this is a pretty well-off neighborhood, the residents who go in on the annual extravaganza actually hire decorating companies to do their displays, and according to a couple of articles (like this one) about the illuminated displays, the neighborhood draws around 100,000 visitors per year - but we were one of a very small numbers of sightseers to brave the first frozen-ish precipitation of the season. Here are some photos - that's it for the write-up, click on the first one to get to a slideshow view. 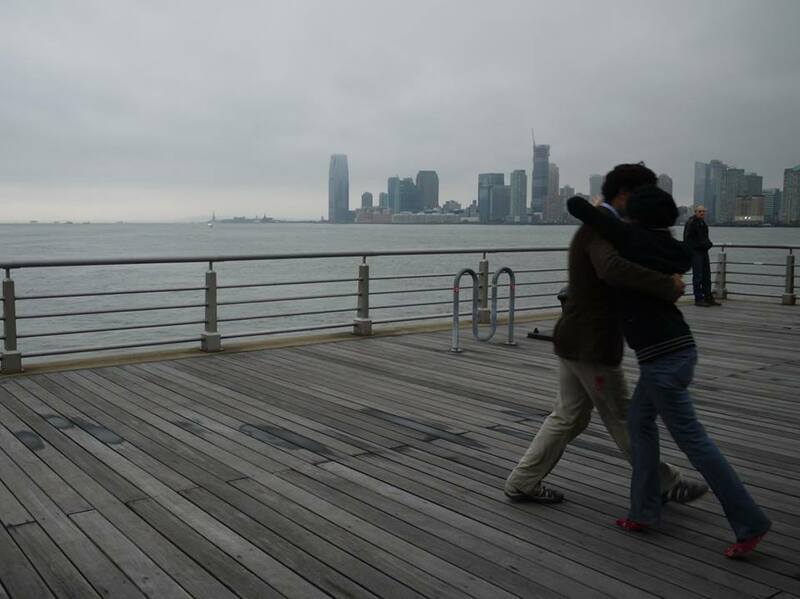 VolvoTango dancers enjoy an atmospheric and unseasonably warm day at Pier 45. 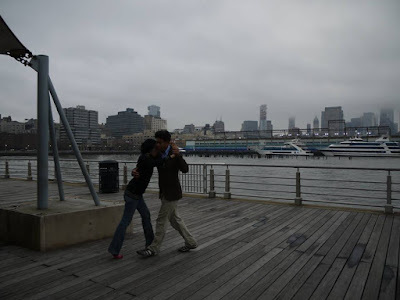 Really, can you picture a much New Yorky-er scene than this? Hope everyone's been having a splendid and peaceful holiday season. 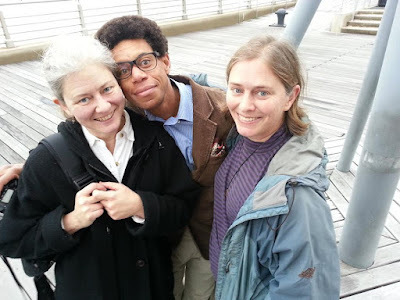 Posting here has been somewhat interrupted by the delightful semi-surprise of having my sister turn up - we haven't seen each other in ages, and she'd run the idea of an NYC visit past me much earlier in the month, but it was dependent on plane fares dropping. I didn't have any big holiday plans (in fact since I'd had two fabulous tropical vacations this year, and had taken full advantage of my seniority at the office to take the last two weeks of the year off for the last couple of years, I'd volunteered to hold down the fort at work this time around, it's quiet here but at least one finance person needs to be around for emergency reporting and approvals and stuff), so I said it would be great to see her, but when I hadn't heard any updates for a couple of weeks, I'd just assumed it wasn't happening. Well, plane fares dropped late in the week before Christmas and she had to jump fast to get 'em, and I found out that she was on her way when she was literally on her way! She's been having a great visit, she's a good independent traveller, I've been joining her for sightseeing and fabulous meals (Gramercy Tavern! Pearl Oyster Bar! Bubby's! Castello Plan!) when I can and she's been amusing herself quite successfully when I couldn't. 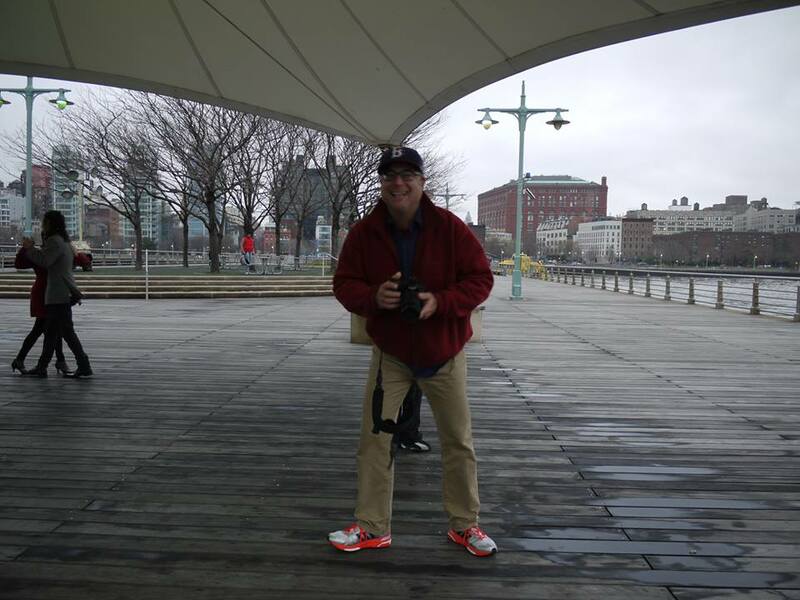 Sunday was a bit gloomy but warm, and we went for a walk in the Hudson River Park (among other places). 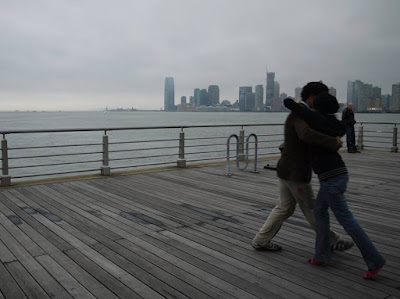 I was absolutely delighted when I heard the tango music and saw the dancers at the end of the pier, I have a couple of paddling friends who are regular tango dancers and sure enough, although one tango regular wasn't there because she was feeling a bit under the weather, it was great to run into Steve B. (one of the VolvoTango organizers) and Derek O. there! 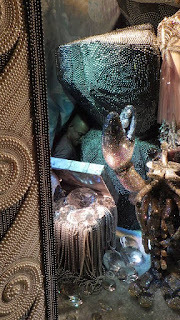 NYC Holiday Windows Part 3 - Tiffany's and Berfdorf Goodman - saved the best for last! These kids loved the sparkly Bergdorf Goodman windows - couldn't resist taking their picture, they were so cute as they oooh'd and aaah'd! Part 3 was after the carol service, which was very nice, as I think I mentioned in the last post. The sun had gone down while we were there, which makes the windows show up better, and we'd saved our perennial favorites for last, those being Tiffany's, which always does these lovely little themed vignettes in their smaller jewel-box windows, each showcasing some nice little Tiffany's baubles, and then Bergdorf Goodman's, which is always very very very WOW. This was especially the case this year as they were sponsored by Swarovski and apparently had unlimited mountains of crystals with which to cover EVERYTHING - so they did! Tiffany's had made each window into a perfect little theatre, with little footlights and a different stage set in each one. Click here for a short photo album of these two. Enjoy! Sneak preview of Part 3. 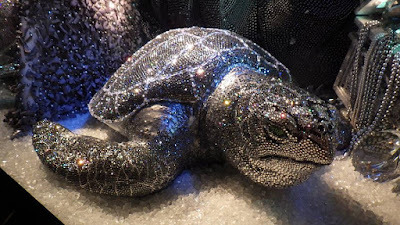 Happy Honu-days! We made a little bit of a change to our usual holiday-window-viewing routine this year. I think we usually go after work, or later in the day if we go on a weekend. We were trying to remember how we settled on that and we think it's because when we went on a weekend day once and the crowds were just too much. There are always too many people out there, that's just part of the deal, but there are degrees of crowdedness and apparently our one daytime outing featured a degree or ten more than we could handle. Mandy was interested in some holiday music this year, though, and a couple of weeks ago it hit me that the Brick Presbyterian Church has a lovely carol service. I sang with the choir there years ago and Keith Toth, who was and still is the music director at the church, always picked interesting and beautiful carols and hymns for the choir to perform, combined with a few old favorites for the congregation to sing. That was at 4. Mandy picked Jane, a restaurant on Houston Street, for brunch; they turned out to be pretty popular*, with no reservations between 10:15 and 4, so we decided to take the 10:15 reservation, eat, go see windows until it was time to go to church, and then finish off whatever we'd missed afterwards (the service wasn't that long). That worked out really nicely; the weather was spectacular, the crowds were surprisingly not as horrendous as we'd expected (plenty of people certainly but we've seen worse), the carol service was splendid (I almost can't believe I used to sing with that choir, they're really really beautiful), and since we started downtown and headed uptown, that left our favorite windows for last (and also for after dark, which is when they really show to the best advantage. Plus that put us at the Rockefeller Center Teuscher shop well before their closing time of 6:00 - treating ourselves to Teuscher is an integral part of our holiday ritual and we were absolutely crushed the first time we got there after closing time! I took a LOT of pictures, as usual, so I decided to split it into 2 sets - click here for the afternoon set, I'll post the evening pix next. Crystal honu above was actually from a high-speed preview of the Bergdorf Goodman windows Mandy and I took a couple of weeks ago - we'd gone to the Metropolitan Museum of Art and swung by Carnegie Hall to see if we could get Mandy registered there for the NYC ID program (free admission in 2016 to 33 cultural institutions, but you actually had to appear in person at each one to register - I didn't even try but Mandy has been doing this amazing cultural marathon through the fall getting herself set up, which was fun for her friends as we took turns joining her) so we were in the neighborhood and couldn't resist taking a quick look. I think this was the weekend before Thanksgiving, and the designers were literally putting on the finishing touches, which was fun to see. See the designer here? What a cool job that must be. The Bergdorf windows are always pretty spectacular but this year they were sponsored by Swarovski, so extra extra sparkly. Tomorrow - Holiday Windows Part 2: After dark!
. My next idea was Sarabeth's, which was even MORE popular than Jane - reservations there were going to be at 8:15 am or 5 pm, nothing in between. Whoa. We'll save that for sometime when we're planning a little more in advance - with Mandy signed up with the NYC ID thingy at the Met I'm sure we'll get back up there sometime next year, plus getting back up to my old neighborhood reminded me that used to love visiting Cooper Hewitt, the Museum of the City of NY, and the formal garden in Central Park that are all up there, all of which Mandy would love, so we are multiple excuses for returns to that neighborhood). Boy, am I ever spoiled by Courtelyou Road - I don't think I've ever made brunch reservations in my neighborhood! 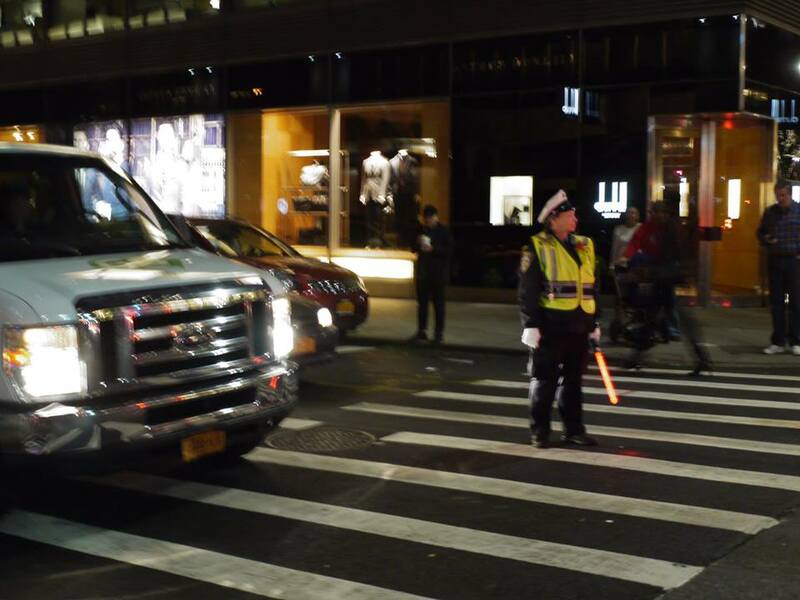 Yesterday's Jedi Traffic Cop and numerous colleagues in blue were helping maintain the traffic flow in midtown Manhattan. What was I doing in midtown Manhattan on a weekend day? Same thing I do once every year around the holidays - yep, on Sunday it was time for my annual holiday shop-window viewing and Teuscher chocolate splurge with Mandy! We couldn't have asked for nicer weather, we've been having this ridiculously springlike warm spell for a while here that's got all the flowering bulbs confused and coming up - boy will they be in for a shock when winter finally gets around to hitting us, but in the meantime, what excellent weather for strolling outdoors. I actually did that on both days this weekend; TQ and I joined a pleasant crew from Sebago in a tour of Green-Wood Cemetary (tour of a cemetary may sound a bit weird and macabre to those who are not from NYC, but it dates back to the early 1800's, is a beautifully landscaped and well-cared-for green space, and became a very popular burial site during the Victorian era, when mortuary art reached wild heights, leaving some astounding memorials behind. It's also the final resting place of some fascinating people, and Commodore Emeritus Tony did some good research to prepare for the tour and led us by familiar names, good and bad (Tiffany, Ebbetts, Tweed) and some less familiar names (Henry Chadwick, anyone? Eliza Gilbert?). That was a lovely day, and then Sunday was just as nice. I have a ton of pictures to sort through but I thought I would start off with a set showing jewelry for buildings! Here's Cartier, Tiffany, Bulgari, and Harry Winston, all dressed up in their holiday sparkle. "The Navigators" at the Center for the Urban River at Beczak - pix from a great evening! What a fun night at the Center for the Urban River at Beczak's last Rivertalk in 2015. Deb Kuupuaonaona McCue was the organizer for this one, for which the main event was a screening of Sam Low's excellent documentary The Navigators, preceded by a welcoming chant and then a hula lesson by John-Mario from Halawai and followed by a little more talking story about the Hokule'a, the continuing adventures of the Hokulea Crew (slated to arrive in NYC in June 2016 as part of their around-the-world Malama Honua trip), and how the success of the Hokule'a led to a renaissance of Hawaiian culture. Fantastic evening, I'm so glad I could make it! Great seeing so many friends from the Yonkers Paddling and Rowing Club! Terri and Deb made delicious Island-kine snacks - including spam musubi! Yes! John-Mario sings 'Ano'ai, a song of thanks sung by a guest to their host. In the mountains, the trees of the forest. After this the movie was shown, and it's wonderful. I'm thrilled that director Sam Low has given me permission to do one screening on his behalf at Sebago; our boatbuilding committee is going to LOVE it, ok, everybody will, but especially the boatbuilders - maybe our next boat will be a proa! Afterwards, a couple of tries at blowing the Pu (conch shell trumpet) that Deb brought from home. Jolly old St. Sturgeon-fish, lean your fins this way! Deb, John-Mario, Terri, and me.